On Wednesday 25 May, Classical:NEXT 2016 officially opened its doors with a ‘Dutch Mountains’ gala opening in de Doelen concert hall. For a country renowned for its flatness, the heights the Netherlands’ art music were very much on show at the Classical:NEXT 2016 gala Opening. The "Dutch Mountains" Opening featured a wide range of Dutch talent. The concert was heralded by contemporary marching band 9 x 13 and featured classical guitar innovator Aart Strootman (who performed the world premiere of his 'Counterpoint 21'), sonic adventurers Ensemble Klang, boundary-breaking collective LUDWIG (who tonight announced the inclusion of Barbara Hannigan as a member of its collective), celebrated proponent of ‘pianism’ Ralph van Raat and anti-traditional percussion ensemble Slagwerk Den Haag all took to the stage. 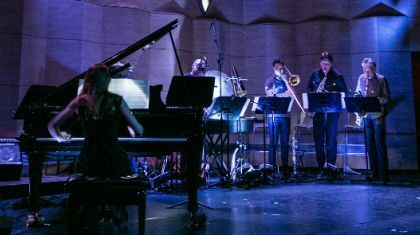 These glimpses into the Dutch art music world were connected and interwoven with specially-commissioned work by pioneering video-maker Jules van Hulst of the acclaimed 33⅓ Collective. 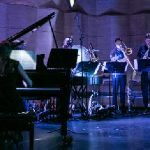 A tutti performance of Louis Andriessen's piece 'Workers Union' wrapped-up the tightly-curated evening that brought together such disparate elements as operatic spinning tops, jawbones-as-percussion and tales of Buddhist moss-gardens. The opening was produced on behalf of, and with the support of, Dutch Performing Arts. The opening artists were selected by De Doelen, advised by young Dutch curators Masa Spaan, Shane Burmania and Floris Kortie. To see more photographs from the Classical:NEXT 2016 “Dutch Mountains” Opening concert by our official photographer Eric van Nieuwland, visit our Flickr gallery or Facebook photo album. For more information about last night's concert, see the Opening page at classicalnext.com.